Get an instant snapshot of system health for all Artifactory instances you are managing in a simple easy-to-read table. See online/offline status, get license information, and know who the administrator user on that instance is. Click any instance to drill down and get a detailed graphic representation of system resource usage such as memory, CPU, RAM, and number of threads. 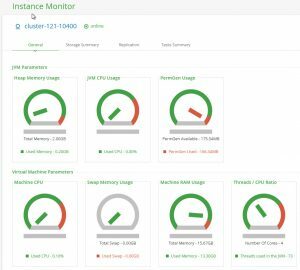 Get a storage summary, clear replication status, and even drill down into running Artifactory for advanced analysis of usage and performance.